"Hopefully we can make some progress," Mattis said aboard an Air Force E-4 jumbo jet that arrived in Beijing's main airport after an 11-hour flight from Alaska. The defense secretary will hold talks with two senior Chinese generals in charge of the People's Liberation Army after a welcoming ceremony Wednesday at the Chinese Defense Ministry. The visit is the first by a U.S. defense secretary under President Trump who has characterized China as a strategic competitor of the United States in a national security strategy made public in December. Building on that strategy, the Pentagon released its national defense strategy that also for the first time in decades declared that China is a strategic competitor to be challenged under new defense policies. U.S.-China military relations are strained over China's militarization of disputed islands in the South China Sea. The Pentagon disclosed earlier this month that China has deployed advanced anti-ship and air defense missiles on the Spratlys islands that are claimed by China and Philippines. The missile emplacements contradicted a 2015 public pledge by Chinese President Xi Jinping not to militarize the disputed islands. Mattis is expected to meet with the Chinese supreme leader during the visit. The Pentagon disinvited China's military to take part in the world's largest naval exercises known as Rim of the Pacific that are set to begin this week. Mattis told reporters on Sunday the Pentagon is reviewing military-to-military relations with China to make sure the exchanges fit within the new defense strategy. China's Defense Ministry announced Mattis' visit on Tuesday and state media, which reflects official government views, described U.S.-China military ties as difficult. 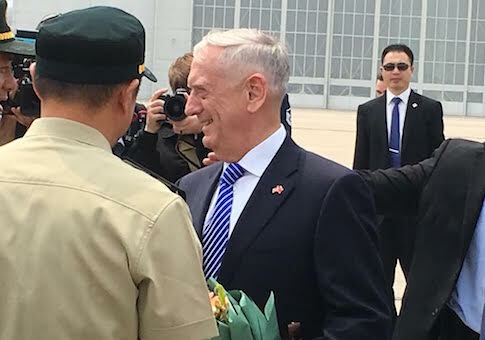 "Mattis' visit comes at a time when China-U.S. security ties are facing problems," Chinese military expert Wang Yunfei told the Party-affiliated Global Times. Wang said many military communications channels were suspended as a result of the Pentagon's disinvitation of the PLA to the Rimpac naval exercises. Global Times also published an editorial Tuesday criticizing Mattis under the headline "Mattis should listen rather than criticize." "Chinese are deeply concerned about Washington's containment plans against Beijing," the Global Times said, adding, "China is indeed worried about being blackmailed by the U.S. and therefore needs to strengthen its nuclear force." Noting hundreds of U.S. military bases around the world, the newspaper said "this is hegemonistic mentality." "We hope Mattis can take advantage of this visit to seek maximum common ground with China," the newspaper said. This entry was posted in National Security and tagged China, James Mattis. Bookmark the permalink.